These Tuesday Stretch sessions seem to roll around very fast, even with three writers! It’s BugDoc Dave here tonight and I want to discuss something really different! Last year, I declared to the Stretch Glass Society that I believe that Consolidated Glass Company made stretch glass! I suspect that Barry Wiggins would strongly debate me on this, but here is my thinking. Consolidated made a line of cased glass in 1930 and 1931 that was called the Regency Line. (This fits into the other stretch glass production period.) Pieces in this line were usually made in the Catalonian molds (this is a large line that generally looks like broad, irregular rings which give the pieces a rough, handmade look). The pieces always start with an opal-white interior gather of glass which was then overlaid with a transparent color, usually pink or blue. Most of these cased pieces were simply fire polished (leaving a shiny surface), but a few were given an acid satin finish, AND some were doped (sprayed with a metallic salt, just like carnival and stretch glass)! To make things more interesting, the doped pieces were reheated which gave them the stretch effect. 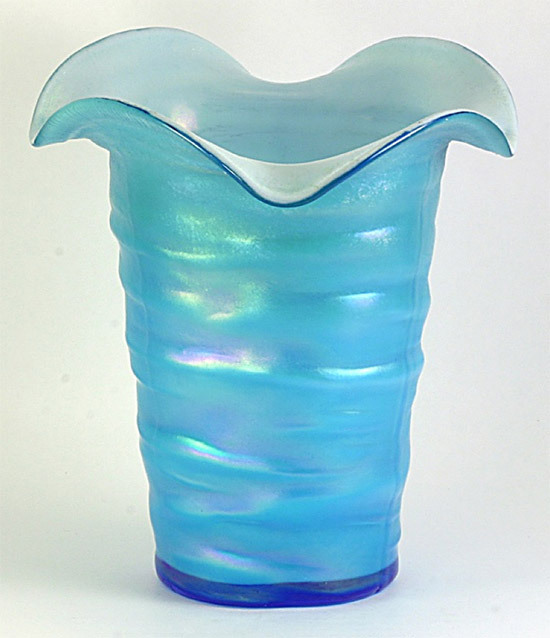 My first example is a vase that has a four-crimped top. 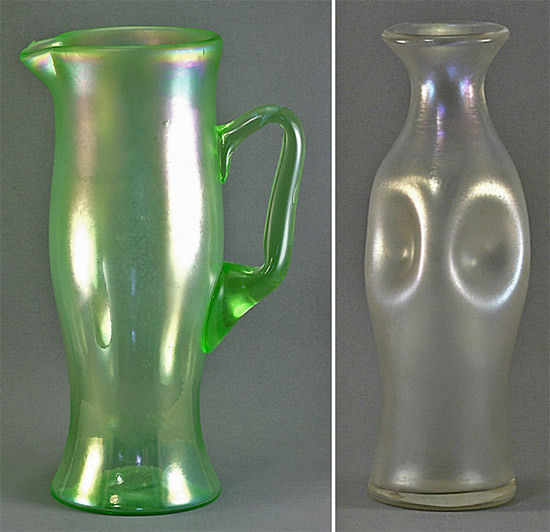 Barry had no problem recognizing these pitchers and vases as true stretch glass. I agree! But, if I agree, then the Consolidated Regency pieces that have the stretch effect should also be recognized as stretch glass! These pieces are not easy to obtain and most are vases with different top treatments. 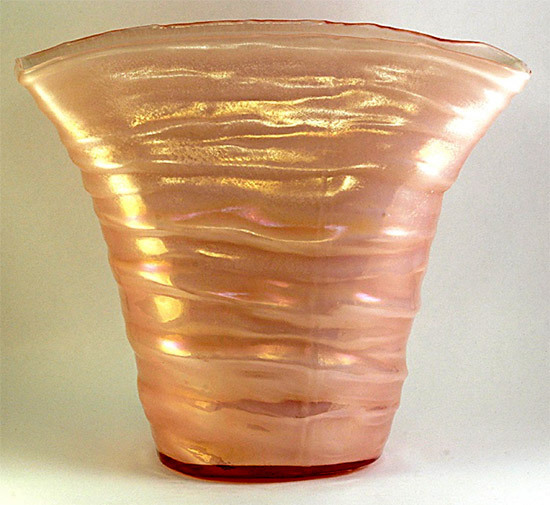 A fan vase in pink. 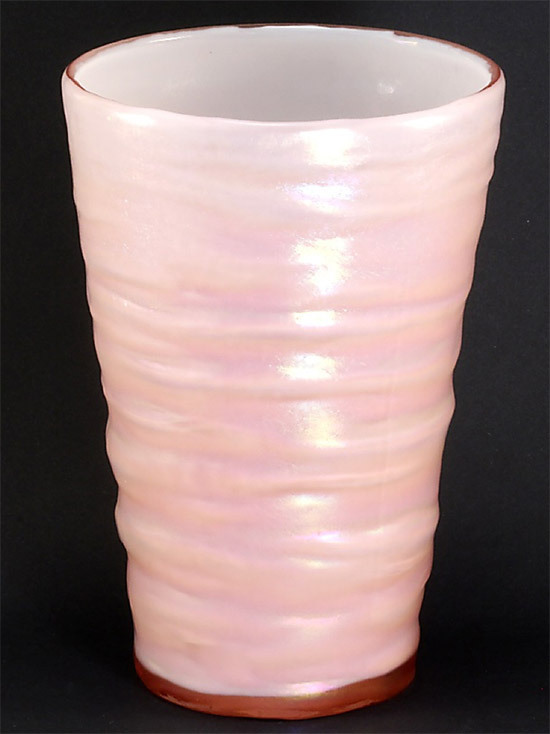 A “normal” (how it came out of the mold) vase in pink. 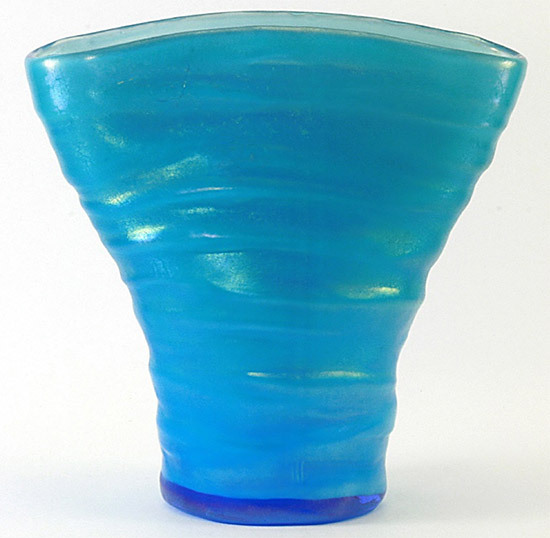 Another fan vase, but in blue. 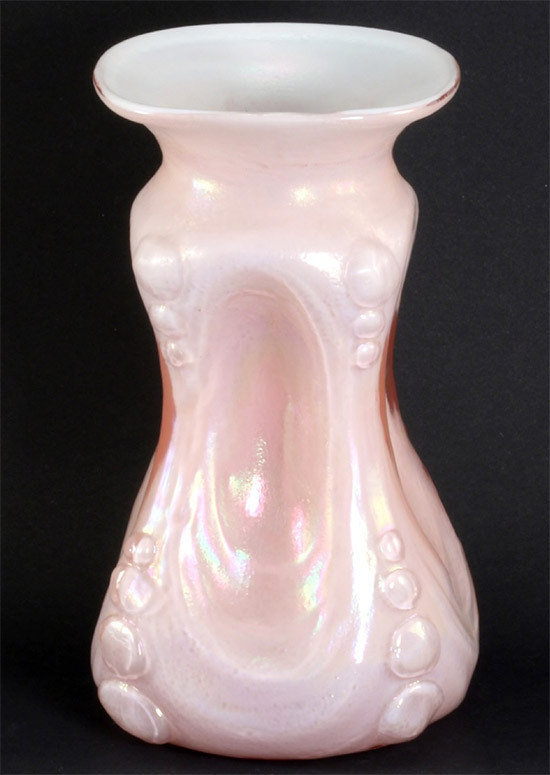 At this summer’s convention, one of the “Spanish Knobs” vases in Regency pink showed up! Enjoy!